A review of fender benders, side-swipes and pile-ups recorded via the WTOP Traffic Center's incident database over the past years shows where and when Beltway crashes are most likely to happen. WASHINGTON — Thousands of vehicle collisions occur on the Capital Beltway every year but some stretches of the Inner and Outer loops appear to be more dangerous than others. The WTOP Traffic Center’s incident database captured a total of 3,463 fender benders, side-swipes and pile-ups on the Beltway in Maryland and Virginia from Sept. 1, 2017 to Aug. 31 2018. The data show that the frequency of collisions on the Beltway increased dramatically from south to north, with the highest number of crashes recorded in Montgomery County. The most crash-prone portion of the Beltway over the last year was shown to be near Georgia Avenue with 201 wrecks logged on or near the exit ramps. The portion of the Beltway near Connecticut Avenue took the No. 2 spot with 155 crashes recorded over the past year. Hundreds of additional collisions were reported near Interstate 270, Rockville Pike, River Road and New Hampshire Avenue. In Virginia, the two-mile long portion of the Beltway on either side of Interstate 66 was the scene of 111 crashes, ranking sixth on the list of 44 interchanges and two big bridges. The lowest number of crashes was observed on either side of the Woodrow Wilson Bridge, with just two to three dozen reported near U.S. Route 1 and Interstate 295. A total of 81 crashes were recorded on the Wilson Bridge itself, including one that closed the Outer Loop for hours last June. Between Alexandria and Oxon Hill, crashes in the local lanes outnumbered crashes in the through lanes three to one. There were slightly more crashes on the Outer Loop — 1,797 crashes — compared to the Inner Loop’s total of 1,666. On a broader scale, with the Beltway divided into just seven zones, the correlation between latitude and frequency of crashes is just as evident. The selected zones range from about 8 to 10 miles in length and are as follows: Oxon Hill to Joint Base Andrews, Forestville to Landover, Greenbelt to College Park, Silver Spring to Bethesda, Bethesda to McLean, Tysons to Annandale and the Springfield interchange to just east of the Wilson Bridge. Whereas just 292 crashes occurred between Indian Head Highway and Allentown Road in the Oxon Hill-Andrews zone, the data show that 773 crashes occurred on the 8.8 mile stretch from just east of New Hampshire Avenue to I-270 in the Silver Spring-Bethesda corridor. That works out to about 88 wrecks per mile, besting the second highest average calculated for the Greenbelt-College Park zone of 60 per mile. 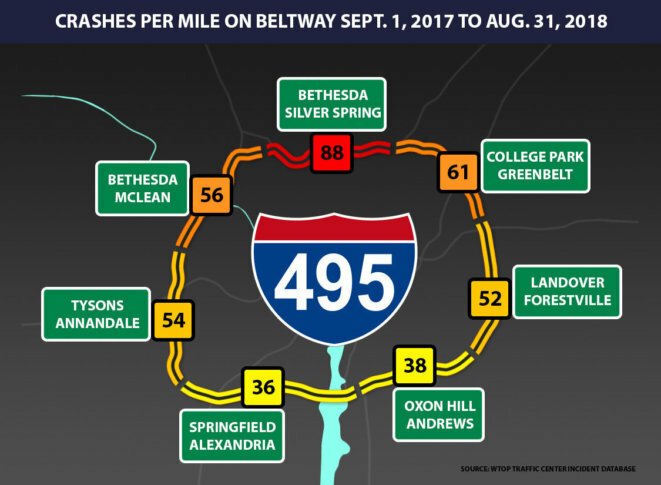 The average number of collisions between the McLean and Bethesda exits worked out to about 56 per mile, despite a slightly higher total number of crashes compared to the Greenbelt-College Park zone. Between Tysons and Annandale, or from just north of Route 123 to a point south of Braddock Road, there were about 54 crashes per mile. The month with the highest number of crashes in the WTOP database was November, followed closely by October. The incident database is updated 24 hours a day, seven days a week. Duplicate entries were not filtered out but only thought to account for a small percentage of the data set. Fewer than 3 percent of the total incidents were obtained through only one source and thus considered unverified. Minor crashes are not always reported to authorities or the WTOP Traffic Center. Although the sampling frame may not be complete, it is likely a good indication of the most crash-prone stretches of the Inner and Outer Loops. Traffic counts provided by Maryland Department of Transportation State Highway Administration show that more than 232,000 drivers traveled the Beltway between Connecticut Avenue and Georgia Avenue in 2016. In addition to carrying more traffic than the section designated as I-95 in Prince George’s County, the highway’s twisty sections over Rock Creek and Sligo Creek likely contribute to the higher number of accidents.